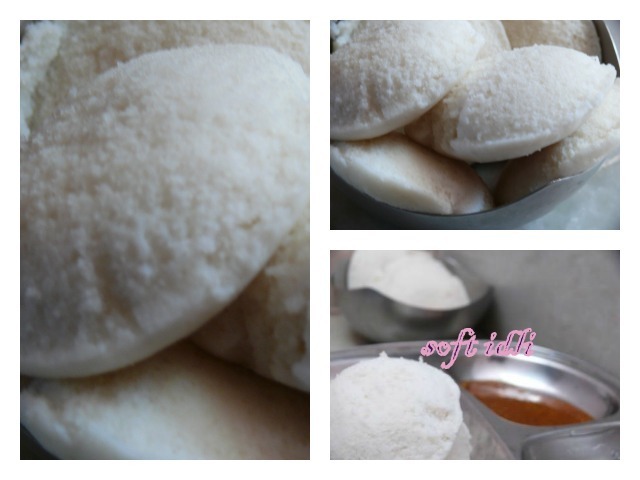 Lets make soft idlis using idli rice which is perfect for sambar, chutney’s ,kurmas, and variety of podi’s. Idli is the traditional breakfast of south Indian people. In my parent’s home this is the favorite breakfast. After coming to my husband’s house ,I have learnt the correct method of making soft idlis . By practice I was able to make perfect soft idlis with idli rice. My Appa and Hubby are the great fans for this idli.For grinding I feel wet grinder gives good results than grinding with mixer or tabletop. water and crystal salt - as needed. Soak both rice and dhal separately with vendayam in it. Soak for four hours then grind dhal first and then the rice. Add salt beat the batter with hand to required consistency. Ferment the dough for 8 hrs minimum. The consistency of the fermented batter should be like this. Stir the batter lightly and now you are ready to go for steaming. Now softest idlis are ready to be served. I steam idli's using cotton cloth which enhances the softness.The cloth material that I usually use is thin dhoti cloth which is best suited for steaming idli's. Usually aval or steamed rice are added for increasing softness.I added only rice and dhal which gave me perfect idli's. Usually I add a fistfull of crystal salt for 4:1 ratio. It will be very helpful for all the beginners,neatly explained. I love idli sambar , it would be great if you can link sambar recipe along with idli 🙂 Btw nice blog.